In British Columbia Appliances and Electronics have already been damaged by BC Hydro installing Itron Centron Smart Meters in Homes and Apartment buildings. Heres the latest News Coverage, followed by some serious stories from the United States! Gary Fielding holds up the main board of his oven unit, which he says was seriously damaged after Corix Utilities installed his new BC Hydro Smart Meter. Gary Fielding is $845 poorer and is pointing his finger at the province’s power supplier for the unexpected financial blow. The Tsawwassen resident claims the installation of his new BC Hydro Smart Meter blew a fuse and damaged his oven, which required costly repairs. “It fried the brain, basically,” Fielding said, holding up the microchip-laden central processing unit that controls both his oven and microwave. An electrician since 1967, Fielding claims the wall-mounted oven unit was compromised due to a power surge when the old meter was removed while under “house” utility load. But more than one month after the incident, Fielding is no closer to getting his costs covered. Corix Utilities, the company contracted by BC Hydro to install 1.8 million new wireless meters across the province, recently denied any liability. “It sort of sickens me that these big corporations don’t take responsibility for their actions. They say, ‘No, go away, I’m not going to give you the time of day,’” Fielding says. Fielding’s 18-year-old son Will Gale was home playing video games Nov. 15 when he heard a noise in the garage. Upon investigation, he discovered the family’s old BC Hydro meter was being replaced with a Smart Meter. The power went out for a few minutes, after which Gale discovered the microwave was not working. Fielding arrived home from work later that afternoon to discover the oven was also broken. All other household appliances and electronics were operating normally, he said. Fielding faxed Corix the bill from Trail Appliances, which included repair costs, service calls and taxes. But Corix responded with a letter dated Dec. 6 from Jennifer Toledo, insurance administrator, denying liability in the claim. “We are unable to provide reimbursement for any expenses that you may have incurred,” Toledo wrote. A spokesperson for Corix further explained the situation. “I believe that our people investigated it and determined that the changeout of the meter was not the cause of the effect on the oven,” said Jack Touhey, vice-president of public and government affairs at Corix. He said meter installers follow a prescribed procedure upon arrival at a home. “They try to communicate with the homeowner or resident by knocking on the door, and if someone’s there, telling them that they’re about to change the meter,” he said. “The meter changeout is just a few minutes and it’s really no different than what a temporary power outage would do or a quick flick of the main power switch off and on that a repair person might do,” he said. Touhey said there have been rare cases when the power going off and on may be “the last leg” for an older appliance. “Everything after the meter is owned by a homeowner and electrical systems can be at varying stages of age and capability, and this changeout may expose some of those issues,” he said. He said Corix investigates all claims of damaged appliances. “If, and it’s very rare, we believe that it’s caused by the meter changeout, unfortunately the repair cost is the customer’s responsibility. As an electrician, Fielding said he takes issue with the Smart Meter installation process. Though he did receive advance notice that meter installers would be in his area, he said no one knocked on his door upon arrival. “You can imagine if somebody was on life support and they (installers) just come in and yank the meter, and the backup power isn’t there,” he said. But Cindy Verschoor, spokesperson for BC Hydro’s Smart Metering Program, said meter exchanges are simple, routine procedures. “There is actually no precedent that exchanging a meter is really any different than plugging or unplugging an appliance or even an outage,” she said. To date, almost 78,000 meters have been installed in the Richmond/Delta area with another 24,000 to go. “I’m not aware of any cases where there’s been a failed appliance where we’ve reimbursed the customer,” she said. Smart Meters have been criticized by some who say the wireless devices are an invasion of privacy and pose health and safety hazards. One local resident sent a letter to BC Hydro and Corix refusing the installation of a Smart Meter on her property. “It has the capability of being a surveillance system, used by you or other parties, which could violate my right to privacy,” wrote Tsawwassen’s Heather Colls, adding she has a right to protect her health from “a possible carcinogen, specifically radiofrequency electromagnetic fields” emitted by Smart Meters. Tsawwassen’s George and Elisabeth Bradley have also attempted to block installation of a Smart Meter. “We fear that it will contaminate our home with radio-frequency radiation which is a dangerous toxin that has been classified by the World Health Organization/International Agency for Research of Cancer as ‘possibly carcinogenic to humans,’” they wrote. Ladner resident and former B.C. premier Bill Vander Zalm last month asked Delta council to take action to stop the installation of Smart Meters in Delta until further research has been done. “Why should we allow the provincial government and the BC Hydro to play Russian Roulette with our health and well being?” he wrote. “If the provincial government (ala BC Hydro) has a billion dollars to spend—there are many social needs, during a time of recession, that are far more in need than changing meters,” Vander Zalm wrote. BC Hydro defends the safety of the wireless devices, saying residential Smart Meters are active for an average of one minute per day and the exposure to radio frequency from a Smart Meter, over its entire 20-year life span, is equal to a single 30-minute cell phone call. BC Hydro says the new meters will allow power to be restored faster in the event of a power outage, and they are expected to save customers $1.6 billion in avoided costs and increased efficiencies over next 20 years. The Clean Energy Act of May 2010 mandates that BC Hydro replace every old meter with a smart meter by the end of 2012, with or without the consent of the homeowner. Meanwhile, Fielding believes the changeover is a “money grab” that could result in BC Hydro charging more during peak electricity usage hours. He said he will continue to pursue the electricity giant to reimburse him for his oven repair costs. Shellmont resident Jack Rochfort was forced to buy a new refrigerator after his blew following the installation of a smart meter at his 42-year-old Richmond home. BC Hydro smart meter at his Shellmont home. On Aug. 5, a contractor from Corix Utilities arrived at Jack Rochfort’s home to install a new meter as part of BC Hydro’s province-wide smart meter replacement program. Rochfort said his 10-year-old refrigerator was working fine that morning—until the power went out. Unaware his mechanical meter was being replaced, Rochfort thought little of a brief power outage, noticing electricity was restored to his home within a few minutes. It was then his refrigerator began making noise. He called a repairman, who, after charging $76.16 for the service call, suggested a power surge could have caused his refrigerator’s compressor to fail. Rochfort bought a new fridge for $711, and appealed to Corix. But the company couriered him a letter dated Aug. 18 that denied responsibility for the failure of his appliance. “Corix followed all company safety and installation procedures,” wrote Jennifer Toledo, an insurance administrator with Corix. Rochfort, a retired truck driver who has lived in the same home since it was built in 1969, said he was notified about the installation about two weeks before it happened, but wasn’t aware the contractor had arrived on the day. Richmond is one of the first cities to get smart meters—digital devices that can capture and record the amount of power that is consumed in a given period. BC Hydro aims to have 1.8 million smart meters installed in homes and businesses throughout the province by the end of 2012. A form letter from the utility notifying residents about the pending installation says installers will knock at the front door of a home before starting work and power will be knocked out for one minute during the installation. It suggests that homeowners ensure a backup power supply is available for critical equipment that requires constant power. The letter also warns a home security system may be triggered in the event of a power outage. Rochfort called the process “heavy handed,” insisting contractors should have to get permission from property owners before replacing meters. But the chief project officer of BC Hydro’s smart metering project said it’s “highly improbable” meter replacement could cause appliances to fail. Gary Murphy said appliances are designed to withstand simple power interruptions, such as those caused by storms. Replacing a meter is no different. “Old appliances or new appliances have an extremely low probability of having anything go wrong. It’s like unplugging your refrigerator and plugging it back in. If there’s difficulty with that, then the customer ought to be concerned and probably replace the refrigerator,” said Murphy, who has worked on such projects throughout North America. Murphy said customers have the right to appeal to BC Hydro if they’re not satisfied with a response from Corix. BC Hydro would then investigate the claim. Installation contractors are not certified electricians, but Murphy said they needn’t be. The replacement process, he noted, is as simple as removing a plug from a receptacle. Nearly 10,000 meters have been installed in Richmond so far—about one-tenth of BC Hydro’s Richmond-Delta billing area. Crews are also now working in Terrace, Prince George and Victoria. Contractors have the legal right to enter private property to service meters under the Electric Tariff. “It’s fairly standard business practice for us to replace meters, and it’s quite complex and costly and time-consuming and frankly not cost-effective to schedule appointments with customers,” he said. The smart meter program will ultimately benefit BC Hydro customers, said Murphy, noting the utility will realize $520 million in net benefits in the program’s 20-year cycle. Smart meters will also provide customers with information about their own energy use, offering further potential savings. The Richmond Review asked the BC Safety Authority about necessary qualifications for meter replacement contractors. Spokesperson Ariela Friedmann said only “trained individuals” should do the work—but not necessarily electricians. She also said a power surge caused by the installation of a new meter is unlikely. Meanwhile, B.C. privacy commissioner Elizabeth Denham is investigating the smart meter program to ensure it complies with privacy law. The investigation will include the collection, use, disclosure, retention and security of personal information. A Chilliwack man whose computer was fried by a power surge while having a BC Hydro smart meter installed says hydro customers should be warned to unplug any electronics or turn their breakers off on the day of their meter changeover. Sven Tornlov said he thinks the smart meters are a good idea that will save the province money. But he says he’s now faced with a steep bill to replace his computer after its motherboard died. Tornlov was home last Thursday when a Corix Utilities worker appeared and said she was turning the power off in two minutes. Tornlov said pamphlets mailed to his house warn users to turn off all electronics. But he says there is no mention that they still may be at risk in case of a power surge. “In their literature and the way they talk is it just sounds like it’s just plug and play,” said Tornlov. But Tornlov said he was never told to unplug his computer. “They don’t say anything verbally,” he said. But Tornlov said there is nothing about his computer that would make him consider it “special” in 2011. But Cindy Verschoor, BC Hydro’s manager of communications for smart meters, said the installation of a smart meter should not cause a power surge. She speculated that faulty or old wiring could be to blame for any problems surrounding the installation of the smart meters. Verschoor also said that residents are told to unplug their computers to ensure that anything they are working on is not lost when the power goes out. She said that people do not, actually, have to unplug their computers, but just turn them off. $3,000 …. that’s how much one Bowdoin woman says she’s spent to replace several of her appliances, and she believes one device outside her home is to blame. Autumn Brooke says her new CMP smart meter is to blame. She says the smart meter ruined her new washer and dryer. Brook says CMP replaced her electrical meter with a smart meter on September 8th … part of CMP’s 200-million dollar project to swap out 600-thousand electrical meters. She says that is when she noticed problems with her electronics…from a fried hard drive to her malfunctioning stove and refrigerator. She says she even replaced her well pump and hot water tank in the same week. John Carroll from CMP says smart meters use radio signals that may interfere with things like phones or internet service, but he says they likely aren’t to blame for Brook’s appliance problems. they’re on the customer’s end. Brook took matters into her own hands. She had her smart meter removed in late November … after spending $3,000 to fix her appliances. She’s now paying a 12 dollar a month fee for an analog meter. A price she’s willing to pay to restore her peace of mind. 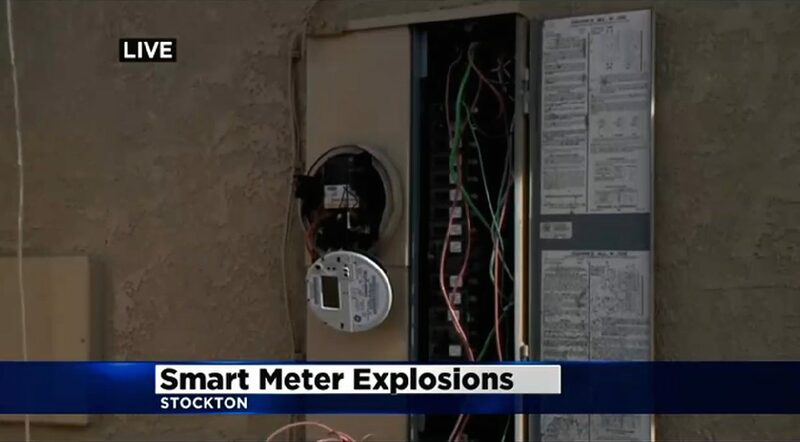 STOCKTON (CBS13) — A power surge left thousands without power in Stockton on Monday after smart meters on their homes exploded. Neighbors in the South Stockton area described it as a large pop, a bomb going off, and strong enough to shake a house. “The neighbor across the street, his meter doesn’t look as bad but his receptacles are all blackened.” said Brad Abernathy. PG&E says a dump truck crashed near its Alpine substation on Arch Road. When the truck hit the utility pole, the top wire fell onto the bottom wire, creating a power surge. Power is expected to be restored to most customers by Monday evening, but the damage varies by home. Just had a power surge caused by bc hydro replacing a power pole with a transformer out front of my home. Absolutely warning notice was given to us about this being done. Fridge was perfectly fine in the morning. Power lines to my house were removed and power was off for 4-5 hours. When power comes back on the fridge was damaged and not working. The surge shorted out the main board on my new fridge and cost me $600 to get it repaired. The repair guy even put on the bill about how the power surge was the best explanation for the damage. Hydro did not even talk to the repair guy, they did not investigate anything just sent me a letter a week later denying the claim. Does BC hydro take responsibility for anything anymore ?? ?